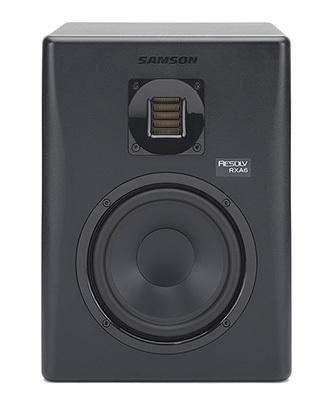 The Samson Resolv RXA6 2-Way Active Studio Reference Monitor delivers the sonic elements that are essential to any studio. Uniting the latest advances in speaker technology and active electronics, the RXA6 is a true reference, professional studio monitor with a flat frequency response. No hype, just precise audio imaging for recording, mixing, mastering and all multimedia applications. 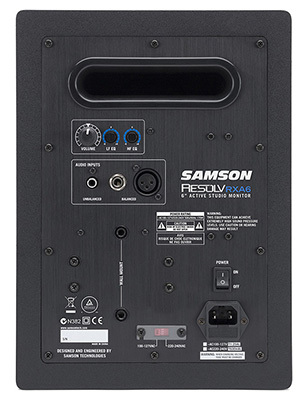 At the core of the RXA6 (100 watts, 45Hz–27kHz) is Samson‘s newly-developed Air Displacement Ribbon Tweeter. The 2.5″ aluminum tweeter’s corrugated ribbon design is able to move four times the air of a standard dome tweeter. The result is a linear response with extended high frequency, accurate phase response and extremely low distortion. In addition, the speaker’s 6″ copolymer woofer with butyl coating forces a fast recovery and quick transient response for tight, low-end performance. The RXA6 employs a bi-amplified design, offering separate amps for both the woofer and tweeter. This optimizes the power efficiency of the monitor’s traditional Class A/B amplifier, ensuring serious dynamic headroom and reducing intermodulation distortion. The RXA6 also features a multi-pole crossover that’s perfectly adjusted to the tuning of the monitor’s components, providing optimal performance and maximum SPL. The RXA6 brings a high level of versatility to your studio setup. Connections can be made via balanced 1/4″ and XLR inputs, as well as unbalanced RCA inputs to directly engage MP3 players, computers and more. In addition to a large center-detented Volume knob, the RXA6 has dedicated high and low frequency EQ knobs for optimizing the monitor to the specific sound characteristics of a given space. 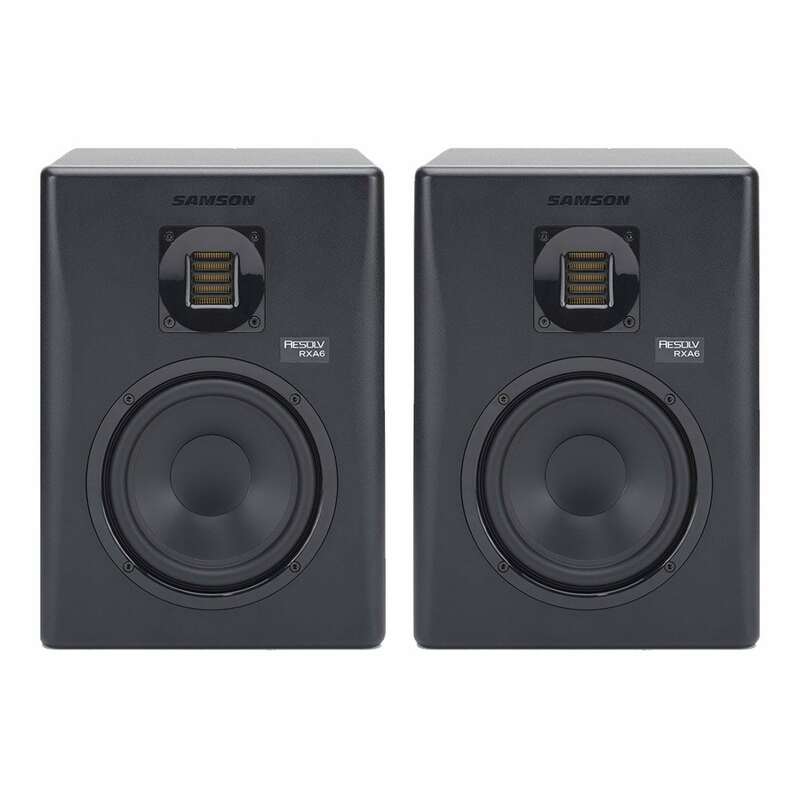 The monitor is constructed of solid Medium Density Fibreboard (MDF) with a vinyl-wrapped finish, resulting in a durable, yet stylish design that would benefit the reliability and look of any studio. A pair of RXA6s is the perfect monitor setup for a variety of applications, including electronic music production. The RXA6’s Air Displacement Ribbon Tweeter accurately reproduces the crisp highs of popular synths and vocals, while its copolymer woofer delivers natural depth to kick drum and bass tracks. DJs can also enjoy seamless transitions given the zero resonance design of the RXA6. Beyond the studio, a set of RXA6s is ideal for producing pro-level audio in a number of situations. Use them as desktop speakers to enjoy studio-quality sound when watching movies or gaming online with friends. Designed to provide fatigue-free music playback for hours on end, the RXA6 is great for the audiophile who simply wants to relax and enjoy their favorite tracks. With the RXA6, your music and multimedia listening experience will be elevated to a whole new level. 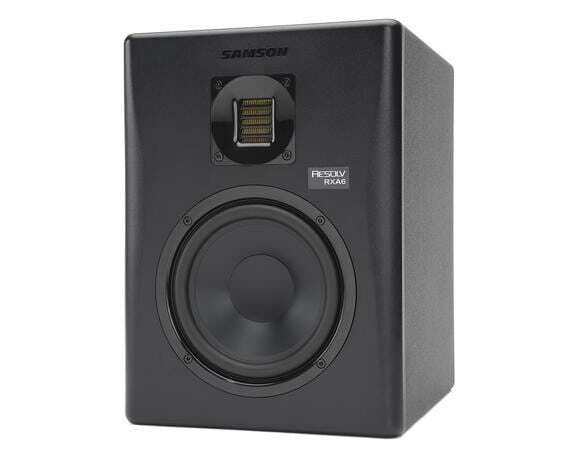 Combining a sleek design, high-end components and meticulous engineering, Samson‘s Resolv RXA6 studio monitor offers a true reference sound with no unnecessary color and distracting hype, just precise audio imaging for authentic and critical sound reproduction.